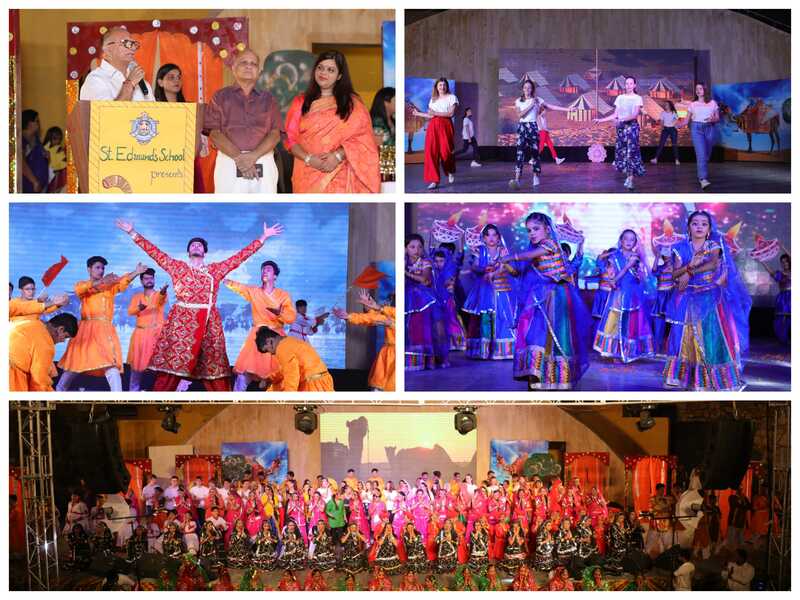 Annual function 2018 "Rangeelo Rajasthan"
St.Edmund’s School, Jawahar Nagar celebrated its annual function with great vibrancy and cheer, on Friday, 02 Nov 2018 at Ravindra Manch open theatre. The annual function was presided over by Mr Ashok Parnami MLA, former president BJP. Other dignitaries present, including Mr Kailash Chaturvedi (renowned educationist & Head of Rajasthan Patrika publication), Mrs Suman Dalela and Mrs Amrita Mathur (Former Staff members of St Edmund’s School), were felicitated. The programme commenced with the lighting of the ceremonial lamp by Hon’ble chief guest Mr Ashok Parnami and Ravi Setia secretary St Edmund’s educational society escorted by the principal and other dignitaries. This was followed by a bouquet presentation by Assistant Head boy and head girl. Principal Mrs Anu Bhatia shared the school annual report of the past session. This was followed by prize distribution. The theme for the function this year was “Rangeelo Rajasthan”. Rajasthani culture is rich with an extended history of honourable kingship and royalty. It was honoured with a performance of ghoomar dance. Chari dance overwhelmed the audience. Manjira dance performance was also held to give the viewers a true feeling of complete immersion in Rajasthan’s rich heritage and traditions. The students also performed puppet dancing, which is another important piece of Rajasthani culture. St Edmund’s nursery school,Vinoba Vihar pre-primary students also performed Kesariya Balam, a graceful dance performance which was full of colours and enthusiasm. The highlight of the ceremony was the participants of the Institute of Saint Dominique, France, who gave a graceful dance performance of cultural traditions of their country. This team was mentored by International Coordinator MRS CAROLYN NORRIS - SCHNEIDER. This musical interlude led way into dramatic performances for the evening which were based on old Rajasthani legends. It opened with the play, ‘Maharana Pratap Ka Swabhiman’. The play was centred around the famous royal leader, Maharana Pratap and his adventures. It was followed by the tale of ‘Khajri ki Beti’, which is centred around the theme cutting of trees. The last act was ‘Hadi Rani’, a place that tells the story of a queen who sacrifices her life so that her husband can live honourably. The bright and energetic performances kept the onlookers spellbound. All the meritorious students, as well as students with outstanding performance, were awarded such as Student of the year award was earned by Tanish Katta, Eklavya award (for best in sports) was received by Kratin Gurjar, Ramanujan award (best in Maths) was achieved by Yash Munjal. The cultural presentation was skillfully organized and directed by Mudra International studio for performing arts and Rang Mastane theatre group. The evening depicted the shining talent of the students and was a delightful experience for everyone present. The programme culminated with the National Anthem.